Vacuum excavation Services available across Brisbane, Gold Coast, Sunshine Coast, Gladstone, Adelaide, Sydney, Wollongong and Melbourne. At ﻿VAC Group, we're proud of our Australian heritage. We are 100% Australian owned and operated and each of our vehicles are produced locally right here on Australian soil. By taking a domestic approach to vacuum trucks, we make sure you experience the benefits of well-maintained machinery. As we tend to our equipment regularly and monitor their performance, we create an approach that prevents unnecessary delays to your projects because of breakdowns. ﻿If you choose one of our vacuum excavators for hire, we can provide you with our extensive and knowledgeable operators. ﻿If you would like to use VAC Group for vacuum excavation services, call us on 07 3483 0588 or click the button below. Why choose VAC Group, vac truck for hire? In an era where vacuum trucks (also known as sucker trucks) have come of age, we deliver versatile services to hundreds of happy clients in areas such as Gladstone. With a meticulous approach to vacuum excavation, our highly-skilled operators make sure your construction and engineering efforts are safe from day one. In addition to wet hire vacuum excavation services, our vac trucks are also available for dry hire. Our team of 155 staff and collection of over 120 vacuum trucks enable us to carry out jobs of any size. With the only independently operated 3D radar for utility depiction in Australia amongst our fleet, we're confident our vacuum excavation services are second to none. 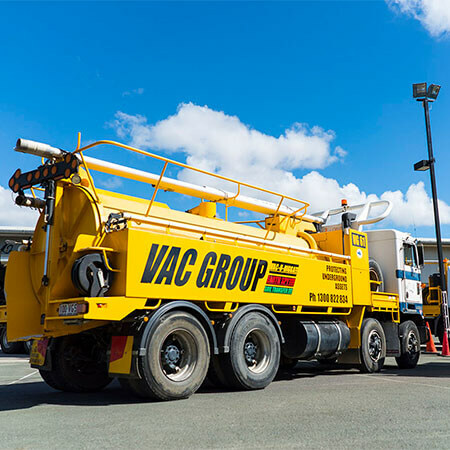 At VAC Group, our impressive fleet of non-destructive machines serve destinations such as Brisbane, Gladstone, Sunshine Coast, Adelaide, Melbourne, Sydney and Wollongong and surrounding areas. Are you seeking non-destructive vacuum excavator services for your next job? Australia’s leading provider of underground asset location, mapping and safe excavation services.